FIRST METEORS OF 2009: The annual Quadrantid meteor shower peaks on Jan. 3rd when Earth enters a stream of debris from shattered comet 2003 EH1. The timing of the encounter favors observers in western North America who could see dozens to hundreds of meteors during the dark hours before dawn on Saturday morning: sky map. 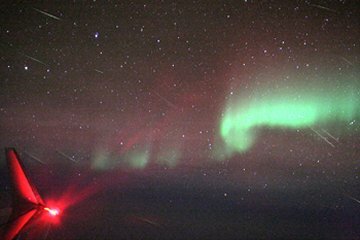 Jeremie Vaubaillon of Caltech created the composite image, which shows more than a dozen Quadrantids flying through the aurora borealis on Jan. 4, 2008. This year's shower could be just as intense. Cold winter weather often discourages people from going outside to observe this fine shower. Are you one of them? Tune into Spaceweather Radio for live audio from the Air Force Space Surveillance Radar. Listening to meteor radar echoes is a fun way to experience the Quadrantids--no parka required. Truhin's pillars, however, are not the ordinary kind. 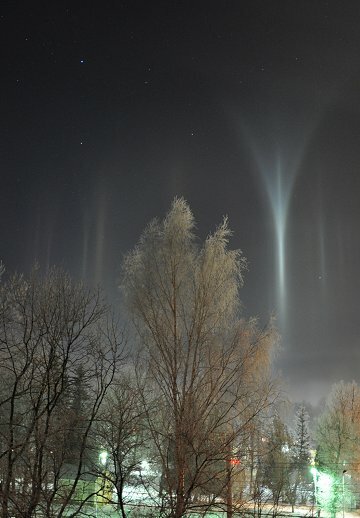 Even two leading experts in atmospheric optics can't quite figure them out: "These pillars are mysterious," say Les Cowley and Marko Riikonen. "They have unexplained curved tops and even curved arcs coming from their base. Arcs in rare displays like these could be from column crystals to give parts of tangent arcs, others could be the enigmatic Moilanan arc or even the recently discovered reflected Parry arc. We do not know – so take more photos on cold nights!" On January 2, 2009 there were 1013 potentially hazardous asteroids.